Here's a quick tour of our home on wheels. Many have asked if we feel cooped up and we sure don't! It's actually kind of annoying because we can't yell to each other from the ends of the RV. :) There's plenty of room and always a place to send a kid (or parent) if needed. We usually rely on the helpful phrase go outside and play, but we've had some cold, rainy days lately and have just hung out inside with no complaints. Well, except about the weather! Good grief, we need to do an updated tour. It looks *nothing* like it did in 2010. :) Here are pics from 2013. Here are 2010 pics. Then take the video tour of the RV! 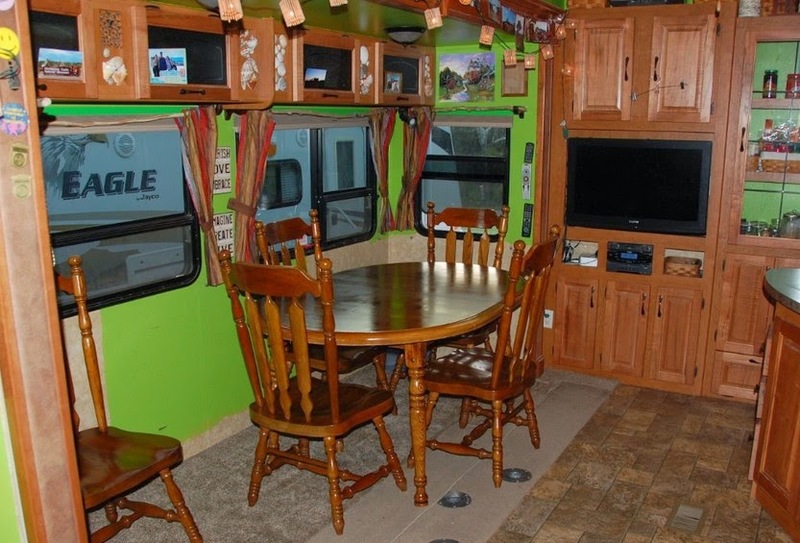 Click here to take a video tour of the RV! wow looks wonderful and so homey :D Love the view from the skylight. where is that part in the rv? Right over the kids’ loft! Wow! What a great setup! Is that a pancake on the table or am I just hungry?